Regarding Point and Figure Charting: — s.c.a.n. I am not a P&F user, although I have read Dorsey and DuPlessis a couple of times each. High-low seems to be the preferred method, and it does give you a more complete and accurate picture of price movement. But since so much of the day's volume often occurs at the close, especially for institutional stocks, there's an argument that the high and the low are just noise, while the close shows commitment. I suppose the advantage to a close-only method would be fewer signals, and therefore fewer false signals. The disadvantage would be, for those signals that are good, you would be late. My own prejudice is, more data is better as long as you can make sense of it, which is why I don't like to rely on P&F - just not enough data. But, it does have the advantage of summarizing long periods of time in a short amount of space. Sometimes, that perspective is helpful. Maybe some real P&F users would like to chime in. The best PnF chart is the one that gives you the best information. They all have different strengths and weaknesses. Using Close ONLY is a great way to see a less noisy chart. It can give clues that might be obscured by the High/Low. 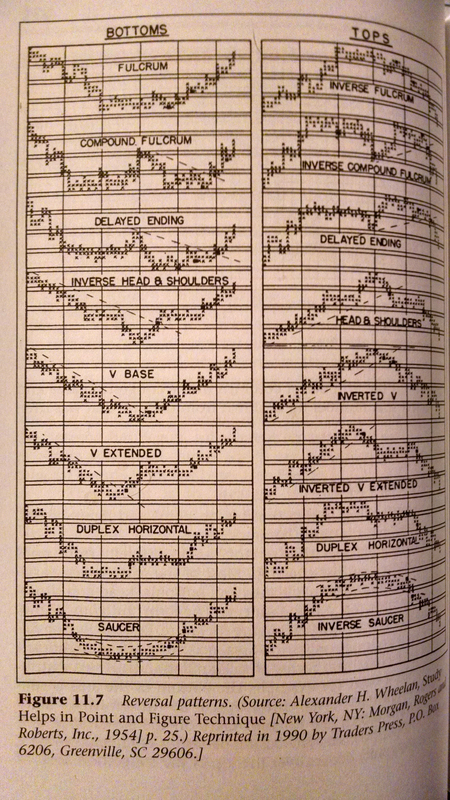 The High/Low is the "traditional" method of plotting the charts. The High/Low can give an early warning or opportunity flag to highlight where the stock is trading. I use PnF chart pretty exclusively for my system. I use the default "traditional" High/Low 3 box reversal chart. I look for, what I call, Dynamic CSS patterns on a point and figure chart. CSS stands for Consecutive Sell Signals. I'm looking for 3 or more. After the 3xCSS or greater is shown, I look for a column of X's that is at least 7X's high. The CSS is a sign of significant distribution. The 7xx a sign of significant accumulation. The questions is how significant? This is where the other chart styles come in handy. I review the chart on a 1 box reversal. I'm looking for signs of a fulcrum pattern. Fulcrums are reversal patterns, so if a fulcrum is developing, that's a significant bullish sign in the Dynamic CSS pattern. I then will review the 3%x2 close only chart. Also looking to see if that is showing bullish (a buy signal). In Duplessis's texts, he writes how you should always review the PnF charts on 2 or 3 scales to get a clearer picture. The 3 box reversal chart has a continuation bias. The 2 box a slight continuation bias, and the 1 box is neutral bias. You can also "play" with the reversals, a 5 box reversal to sell and a 3 box reversal to buy. I should be able to clearly determine the status of a chart after reviewing on these 3 scales. If not, then perhaps the chart needs more time to develop. I tend to avoid making decisions on anything under a 3% box size. On the defaults, when the price gets up there, it's a really small % box size. Like AMZN's default chart (10 points) is a 0.6% trend chart So a box $40 move reverses the chart, but $40 is a little over 2% right now. That is too noisy, in my opinion, and where the % trend comes in handier. To answer your question, the best pnf chart is the one that give the clearest picture of the price activity. If StockCharts ever develops the ability to scan on the other scales, that will be great. If they can put the Yield in the PnF price header, that will also be great. I use those three scales. High/Low on the full figure 1 box. Full figure is the default box size. I may also substitute a 3% x 1 or a 5% x 1 depending on the chart. Remember, the objective is to get a clear picture of the activity. I've attached (hopefully) a helpful image on different looks a fulcrum can take. They are much easier to see on a 1 box reversal than other scales. Jeremy DuPlessis does a great job on covering all of the PnF topics. I also like a rare, out of print book, by Howard Prenzel, call Dynamic Trend Line Charting. I use the concept in looking for a 7xx column (or 2x6xx with rising bottoms) for my "Dynamic CSS pattern". As far as which chart to take signals from, I use a combination of the 3. I prefer to buy in O's or where the O's would be on the 3 box reversal chart. The other scales can clue me in on where that point may be expected to be. I tend to be a "buy in break out area" type and then fill in on a confirmed pull back. Thank you, markd, for the informative and helpful response to my question. You can substitute for the 7xx column, 2 columns of X's that are 6 X's high, but the 2nd column must have a hgher bottom than the 1st. The columns need not be consecutive either. Andrew, Thank you so much for your detailed response to my simple question. I am studying P&F and trying to figure out how to use it skillfully. Your thoughtful remarks inspire me. As I understand you, you use Traditional x 3 High/Low; 3% x 2 close only, and Traditional x 1 box. Am I correct regarding the 1 box? Do you mean High/Low or Close only when referring to the 1 box chart? Your comment about the 1 box reversal chart being neutral is interesting and helpful. As well as your comments about 1 box fulcrums being a reversal pattern. Do you take your signals from the Traditional x 3 box chart or the 3%x2 box or the Traditional x1box? Andrew, Thank you for all your very helpful advice - way beyond my expectation! I found out that the Howard Prenzel book is rare and expensive. Is the Jeremy du Plessis book sufficient in your opinion? If I had to buy one book for learning the PnF methodology, it would be a DuPlessis book. He has several, each builds on the prior, so go for the latest version(s). When learning new things, remember, it takes both time and effort. It's like learning a new language. The more you practice, the better you become. I've read and re-read DuPlessis many times and pick up new things. It took me a few years to become as comfortable as needed. I "created" the Dynamic CSS pattern by combining the principles of Dynamic Trend Line Charting, with The CSS Strategy by Brian Randall. The former is a book, the latter, a method shared on the Dorsey Wright message board and off board study group. The Prenzel book is worth every penny, but better to have the understanding of PnF first, to build upon. I had some good "teachers" to assist my "education". I try to pass it on. George, I maintain a public chartlist on StockCharts.com, in the point and figure section. It contains recent dynamic CSS patterns from the SML and MID pool. As the list is limited to 100 symbols, it's basically showing the last (approximately) 100 names that starts approximately a couple weeks ago and going back. I exclude the most recent ones as a good dynamic CSS pattern will allow a month, or three, to act upon. Quickly formed patterns tend to be less opportunistic, from a longer term perspective. I try to update the list weekly. You could use it as a study guide as you learn Point and Figure. Any questions on that list can be sent on the Feedback button or on this board, I presume. Thanks, Andrew. I am following you at your Public Chart List. Thanks, I'm just starting to get the hang of the public list. If StockCharts ever allows annotation on PnF charts, that would be great. I will say, that if StockCharts added a portfolio management tool, I'd drop my Dorsey Wright membership as well. StockCharts has the best technical analysis site I've encountered, and.... they keep improving. Hi, Andrew. I agree regarding annotation on P&F charts. Thank you, markd, for the suggestion. I will write StockCharts' Support regarding annotations on P&F charts. I am writing to request that StockCharts please make annotations available on P&F charts. For example, to be able to draw what Jeremy du Plessis calls subjective trend lines at reaction points after a trend has started on a P&F chart would be of great help. Thank you, for the P&F charts that you have provided. And thank you for ChartCon 2018. OK. We'll see how things develop. @markd I do make all my suggestions to StockCharts support. A recent one was about adding the Yield to the PnF chart price header. The yield shows on bar charts price header using the Full Quote option. It doesn't show on the PnF chart and no options on PnF price headers. Why is yield important? Well, if you want to see if the chart is using adjusted data, you have no way of knowing or surmising that it is available without seeing the yield data. On PnF charts, unadjusted data often provides a much different look on most charts. But, you'll never know to check the unadjusted chart without the yield indicator. I thought that would be an easy one for them to add. My experience with SC tech support is much different now than when I was a member several years ago. Different ownership perhaps.